Significant progress in dental technology has yielded incredible advancements. 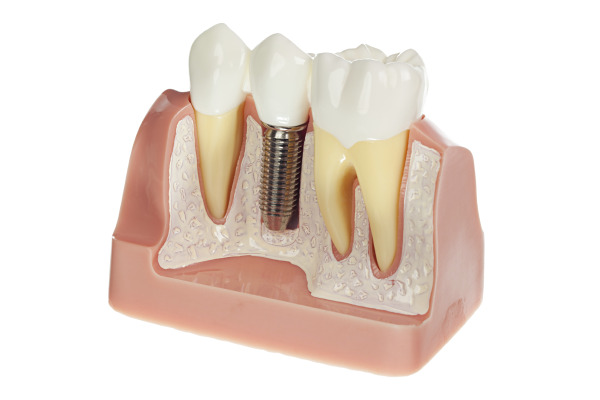 Among these advancements is the use of dental implants to replace a missing tooth, several teeth or denture plate. To better serve our customers, dental implant placement and restorations are available at our Norcross-based practice. Trained and experienced with placement and restorative services, patients appreciate the comprehensive practice of Dr. Vincent. Norcross Dental implants have a profound effect on the dental health of the patient with a missing tooth or teeth or on the stability of dentures. Implants function as a prosthetic root – they are an anchor – and provide a “fixed solution” to prosthetic teeth – a crown, removable partials, or complete set of dentures. Composed of titanium alloy screws, implants are small pieces of metal that are surgically placed in the patients' jaw bone in the same location as a tooth's natural root. An abutment is fitted onto the titanium screw, onto which a crown or dentures plates are securely placed. • Stability: each titanium post secures the new tooth or denture plate. Unhappy denture wearers will no longer have to deal with embarrassing slips or a limited diet. Patients find they are able to confidently bite, chew, talk and smile – with implants, patients regain a natural bite and aesthetic smile. • Durability: the strong metal alloy effectively fuses with existing bone (osseointegration) – it provides the jaw with additional strength and can support normal dental function for a long time. • Dental Health: because dental implants are placed individually, adjacent bone and teeth remained untouched and stops potential shifting of adjacent teeth, premature facial aging and deterioration of the jawbone. Denture patients will no longer have to suffer from mouth pain due to ill-fitting dentures. Dr. Vincent and his team are committed to providing the Norcross community with the best in comprehensive dental implant care. Vincent Dental provides exceptional patient care with a high-tech equipped office that includes computer-guided implant surgery. Patients enjoy the convenience of receiving all their dental implant treatment in one location. With computer-guided implant surgery, Dr. Vincent is able to perform the entire procedure, from start to finish. Detailed imaging technology, and the Biohorizon, and MIS dental implant systems, allow for ease, comfort, and long-lasting results. Patients appreciate the simplified yet high-tech procedure. With Vincent Dental, you'll be smiling in no time! Contact the office for more information on dental implants or other dental services. For your reference, a video of Dr. Vincent performing an implant surgery is available online: http://www.dvincentdental.com/dr-vincent-implant-surgery/. If you would like more information about dental implants, or if you would like to make an appointment, contact Vincent Dental today. Our Norcross office is conveniently located, and our staff is happy to help!